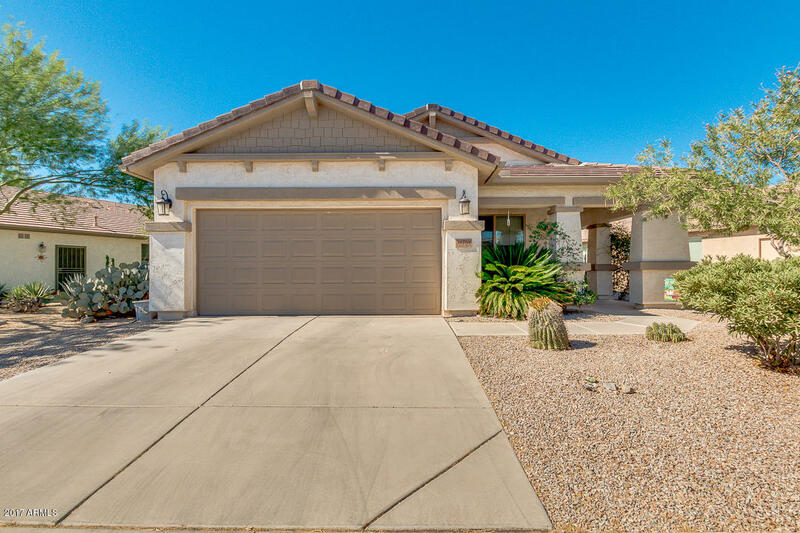 Beautiful 2BR + Den, 2BA, single level home in Solera at Johnson Ranch. N/S facing. Large open Great Room off the eat in kitchen. Kitchen has staggered cabinets, Corian counter tops and upgraded back splash. Great Room wired for surround sound. Den has double glass french doors. Tile everywhere but the bedrooms. Low maintenance desert landscape in front and back. Backyard is South facing with a beautiful mountain views! Master bath has been remodeled with a tile shower and custom mirrors. Washer/Dryer included! New hot water heater 2017. This house is super clean and pride of ownership shows throughout.